Way back in 2008 I got a second charger for my laptop. This means that I can connect my laptop to power both on the couch and at my desk without messing with chargers. Because battery life is so good these days and MagSafe is gone on the new laptops, I plan on using the new MacBook Pro on battery power more often, but I still want that second charger. And that's the nice thing about the move to USB-C: you can now charge using any charger that conforms to the USB Power Delivery (USB-PD) standard. I decided to get a cheap 30 W one, I can always get a bigger one if this one doesn't work or charges too slowly. The downside is that you now need to buy a USB-C to USB-C cable to connect to the charger separately. I tried to find a fully wired one, so I got this 90 cm one from Aukey which has an e-marked chip. Turns out that 90 cm is pretty short, so I'll probably get a longer one at some later point, and maybe a charge / USB 2 one only. Obviously I need to connect to external displays, so I got the DisplayPort cable and adapter as well as HDMI. I was thinking about skipping VGA, but the third party one isn't expensive and I'm sure it'll come in handy a few times. 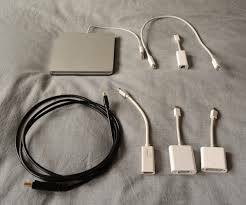 Apple's Thunderbolt 3 to Thunderbolt 2 adapter is pretty expensive, but that way I get target disk mode between my old and new computer as well as 10 Gbps (maybe even 20?) networking between those two, so it's the only reasonable way to transfer files quickly. And I can reuse my Thunderbolt Gigabit Ethernet adapter. Then there's a USB C/A SD card reader, a USB C/A flash drive (which is super fast by the way, at 150/80 MB/sec read/write), a couple of type C to type A adapters. I also got a five pack of USB-C to USB-A male cables by accident. You have to be really careful with the words "USB 3.0" as this is often used for "USB type A connector". And last but not least, a type C to micro-USB. This will let me charge my bluetooth headphones, and with the micro-USB to lightning adapter that I already have, I can use it to charge and sync my iPhone and iPad. To add insult to injury, when the new MacBooks with miniDisplayPort came out, it took a month for the dongles to become available so that first month I had to work without an external monitor, like an animal. At least now the first party dongles are available right away and there are many third party options.